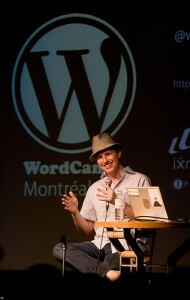 The WordCamp Montreal Report is a collaborative talk show that I will produce during Wordcamp Montreal 2010 (#WCMTL) with a small group of co-producers that will help me funding the production and creating the content. This « unconference« , dedicated to the WordPress publishing platform, is scheduled over the weekend of August 28-29 in a venue to be confirmed in Montreal. Just as the Confoo Report and the webcom live, the WordCamp Montreal Report will be composed of ± 8-minutes interviews with selected speakers, participants, sponsors and organization team members. We plan to make at least 20 to 30 interviews and to release them under the Creative Commons BY licence on Youtube as well as on WordPress TV (in discussion) in order to maximize their circulation and remixes. Technically, I will be running the show with the help of Mathieu Chartier from Kindoweb. Mathieu worked with me both at Confoo and webcom 2010, as well as in many W3Quebec events. As a matter of fact, he suggested earlier this month this new video reporting at Wordcamp and it was indeed an excellent idea! Of course, this show would not be possible without the collaboration of the individuals that will present and attend the conference. In fact, this show is their show and will explore, promote and celebrate their work and expertise. We aim to add a rich layer of conversations and open thoughts to the event providing it with a wider reach and a longer tail on the Web. As with the webcom live we could decide to broadcast the show on Ustream in real time then push the resulting interviews on Youtube. This would imply though that we have a dedicated access to a wired Internet connection with a minimal guaranteed upload bandwidth, no firewall and no trafic shaping that would endanger our communications with the Ustream video and chat servers. Wordcamp Montreal being scheduled on a summer weekend though, I don’t think a real time webcasting would add much value. It’s also more work but a less tricky one to record the interviews and broadcast them with a much better quality (HD 720p+) a couple of days after. We might even publish them first on WordPress TV — even though it is good for the WordPress community and necessary for SEO considerations to upload them also on Youtube. The commercial cost of producing this show (including man hours and equipment) is estimated to ± $3000. This is in fact the overall value of the media partnership. Since I am a member of the WordPress community myself I will supply a part of this budget as will Mathieu, therefore being both invested in the project as co-producers. The rest will be provided by external partners interested in subsidizing the show for their own benefit. The right to initiate and/or anchor a fair share of interviews by themselves — thus showcasing their interest, skills and expertise in an clever, non-intrusive fashion — just as Marc-André Lanciault from INBOX International did with Brendan at Confoo.